Last week a couple driving a semi from Quincy, heading to Burlington, IA, with a load of corn, ran into some complications. Their normal route from Quincy to Burlington, IA, usually consists of Carthage, Dallas City and Lomax, but they ran into construction work which closed the highway to Burlington, Iowa, their usual way, so they had to detour through La Harpe to go to Burlington to make their drop. Not sure just how to travel to Burlington, IA, from La Harpe, they made the decision to turn into Park Lane off of Highway 94 and ask directions. They were not able to make a wide enough turn and ended up with the back tires of the trailer dropping off into the ditch. The highway was blocked off while the accident was being taken care of by La Harpe City employees. Also, coming to help out were Colby Hunt and Jacob Kreps from Hunt Farms with another semi trailer to unload the corn. Talking with the Mrs. (who didn't want to give her name for publication), she states, " No one was hurt and everyone has been so kind." Jacob Kreps is pictured helping unload the corn. ASKING FOR DIRECTIONS CAN BE HAZARDOUS. 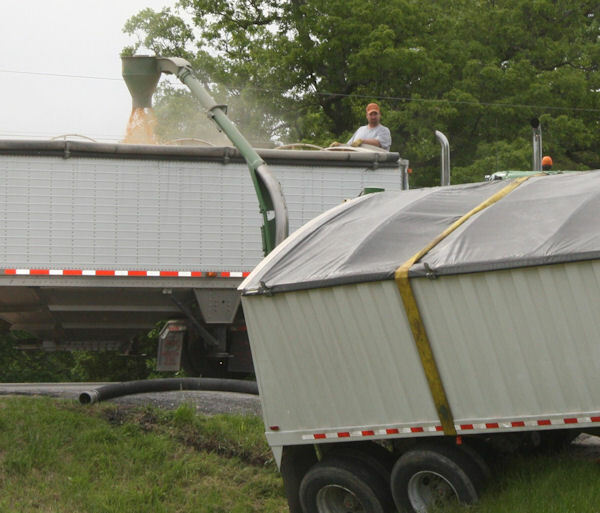 Confused by a detour through La Harpe, a couple driving a semi of corn through La Harpe, ended in a ditch causing folks in La Harpe to find a detour of their own for a few hours last week.